When: Tonight! Doors at 7:30 p.m., show 8 p.m.
Samantha Fish and her signature “aching guitar riffs and thunderous drums” will grace Rose Music Hall this Saturday. As a teenager, Fish honed her guitar skills and gritty blues-rock sound hanging around Knuckleheads music club and other blues guitar masters in her hometown of Kansas City, Missouri. The more she hung around, the more Fish was hooked on what would soon become her musical career. Releasing her third studio album “Wild Heart,” Fish is a seasoned recording professional. Although music is now Fish’s career, she likes to think of it as more fun than a job. She boasts “Let’s Have Some Fun” as top song and her Spotify artist page backs her on that. Fish commands the stage as if she’s the Beyoncé of blues so it’s safe to say that this is going to be one killer show. If you’re wondering who will be warming things up for Samantha Fish this Saturday, here’s a taste of Aina Cook‘s booming vocals. The amount of badass music to be played at Rose tomorrow is going be mind-blowing. Tickets are still available. Ladies and gents, don’t miss your chance to jam and dance. This post was written by Rebekah Northern, contributing writer for The Blue Note and Rose Blog. Categories: Blog, Jazz & Blues, Music News, Rock, The Blue Note, Upcoming Shows & Events | Tags: aina cook, blues, blues rock, guitar, Kansas City, Live Music, live tonight, Missouri, music, Rock, Rose, rose music hall, samantha fish | Permalink. When: Thursday, Dec. 1. Doors at 7 p.m., show at 8 p.m. The Cadillac Three has a distinct fuzzy country rock band sound that is raw and relatable. Experiencing “TC3” live changes the game, and it’s going down tomorrow night. Let me help you become acquainted with these badass musicians. The Tennessean bandmates Jaren Johnston, Kelby Ray and Neil Mason have been creating music together since their teenage years. From playing empty dive bars and crashing couches, to writing hits on Nashville’s music row, to selling out major shows throughout the U.S. and Europe, the trio has collectively encountered just about every high and low within the music industry. From their experiences, a raw and unique sound was born that transcends genres and some may even say eras that go back to 70s southern rock. The Cadillac Three has the ability fully bring down a house full of Lynyrd Skynyrd to Dierks Bentley fans without rearranging a song on their set list. Grinding out hit songs is nothing new to The Cadillac Three, especially for lead singer and guitarist, Jaren Johnston. Along with writing with TC3, Johnston has written songs cut by likes of Jake Owen, Keith Urban, Frankie Ballard and Tim McGraw… just to name a few. A die-hard Cadillac Three fan, like myself, will tell you that it is really tough to pick a favorite song from their albums. Do not miss your chance to see The Cadillac Three at The Blue Note. This post was written by Rebekah Northern, contributing writer for The Blue Note & Rose Blog. Categories: Blog, Country, Music News, Rock, The Blue Note, Upcoming Shows & Events | Tags: cadillac three, CMT, Columbia, concert, country, country rock, Jaren Johnston, Kelby Ray, live tonight, Neil Mason, Party Like You, Rock, ryan beaver, TC3, The Blue Note, The Cadillac Three, The South, White Lightening | Permalink. When: November 11, doors at 8 p.m., show at 9 p.m.
Tickets: $10 advance | $12 day of show. Are you ready for some intergalactic smackdown set to an upbeat punk soundtrack? Well, the extraterrestrials known as Peelander-Z can help sate your need for over-the-top cartoonish violence and larger than life kaiju, when they perform Tuesday, November 11 at Mojo’s. Calling themselves a “Japanese Action Comic Punk band hailing from the Z area of Planet Peelander,” Peelander-Z is made up of Peelander-Green, Peelander-Pink, Peelander-Black, and Peelander-Purple. 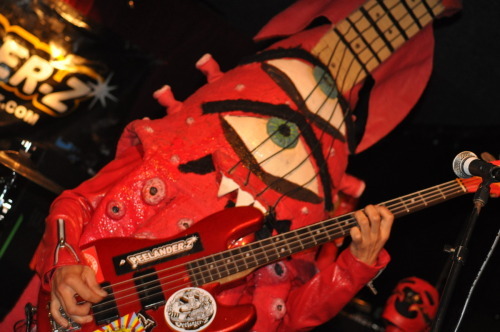 Former members Peelander-Red and Peelander-Blue left the band to teach at Ninja High School and to rule as King of Planet Peelander, respectively. If you can’t tell by this point, Peelander-Z is known for their out of this world persona and extravagant live shows. 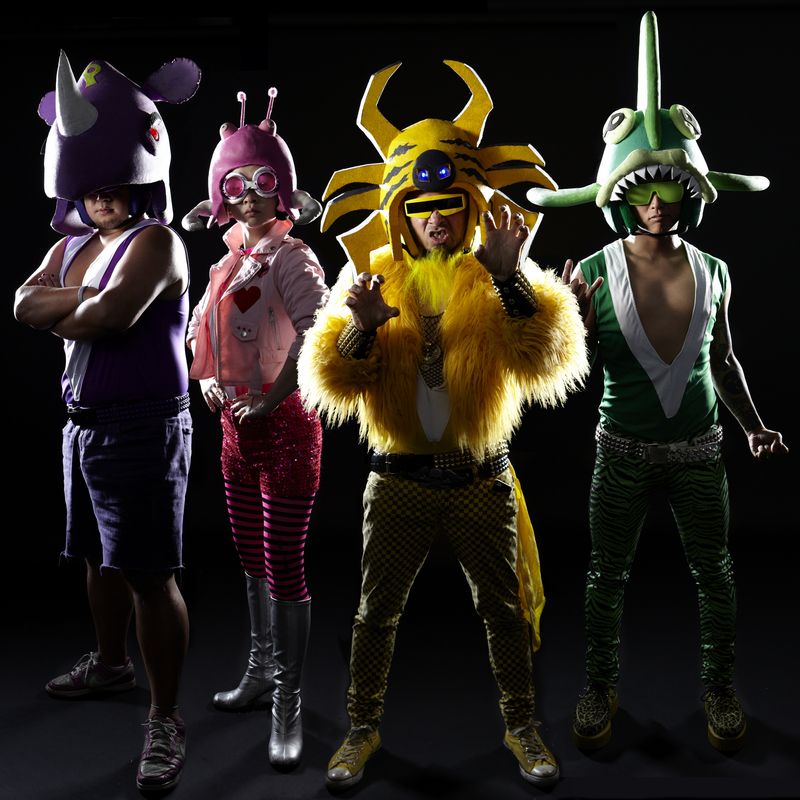 Each member of the Peelander squad wear ridiculously awesome anime inspired clothing, usually evoking The Power Rangers or Godzilla-type movie monsters. For fan favorite song, “Mad Tiger,” they even bust out special costumes depicting a tiger and a squid/guitar costume. A staple at a Peelander-Z show is audience interaction, as the band frequently pull guests onstage to perform alongside them. They have even been known to turn their instruments over to other performers or audience members, so the music can continue while the band members perform a skit. The band members also have a tendency to jump into the audience during the show, which is honestly just the tip of the iceberg when it comes to their hectic live shows. Human bowling, hanging from balconies and stage set ups, fake-fighting between band members mid-song (usually WWE style with a fold-out chair), and even piggy back rides are all to be expected once Peelander-Z step on stage. People going to a Peelander-Z show should expect a workout of the body and mind, as both are whisked away for a set straight from outer space. 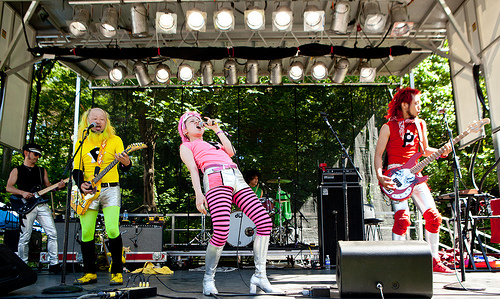 Fighting monsters, spandex clad band members leaping around stage and bowling themselves headfirst into oversized bowling pins are just a few of the wild acts you might witness and partake in, should you choose to accept your mission from Planet Peelander. Opening for Peelander-Z is pop-punk group Running From Paris, a local four piece that formed earlier this year. This post was written by Zachary Van Epps, Contributing Writer for The Blue Note. Categories: Blog, The Blue Note, Upcoming Shows & Events | Tags: alternative, Alternative Rock, Columbia, Mojo's, Preview, Punk, Rock, show preview | Permalink.